Catholics protest in Kaduna state on 22 May, 2018. Governor Samuel Ortom was speaking 22 May at the mass burial of 19 Catholics, including two priests, killed during early morning Mass at St. Ignatius Catholic Church, by herdsmen a month ago. 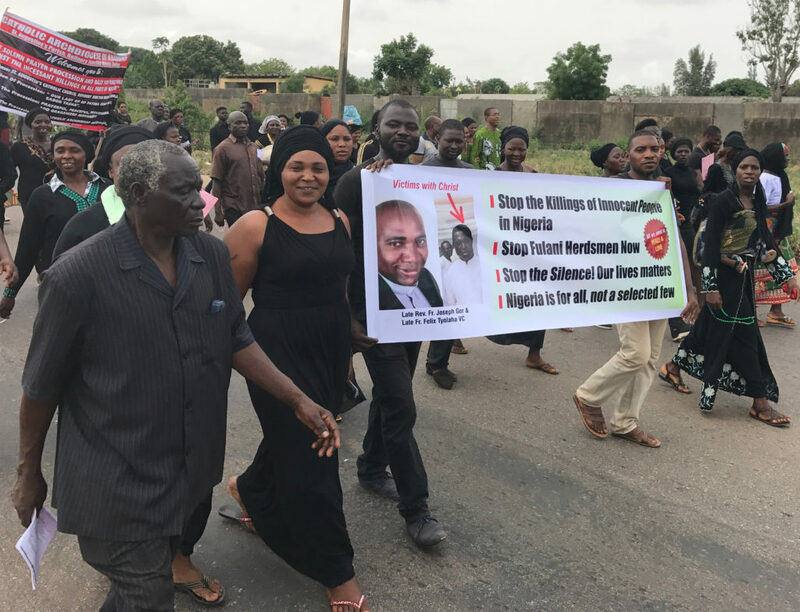 Amongst the mourners was the Nigerian Vice-President, Yemi Osinbajo, who pledged that the killings will not go unpunished, and that the Federal government is determined to end the violence. Such attacks have become recurrent in Benue in recent months. Since the introduction in November 2017 of a controversial law banning herders from open grazing in the state, attacks have been carried out on an almost daily basis. At least 18 of Benue’s 23 Local Government Areas have been attacked, said Ortom. Ortom said the 22 May mass burial was the second of its kind in the state. On 11 January, 73 victims of New-Year’s attacks by herdsmen in Guma and Logo were buried. “The reverend Fathers are not farmers,” Ortom said. “The church…has no grass. It is therefore curious why parishioners…who were worshipping God would be killed by herdsmen in the church. By so doing, the armed herdsmen have moved the narrative of the current crisis from search of grass to other obvious motives”. Ortom also detailed the humanitarian impact of the ongoing violence in his state: More than 180,000 people live in 8 IDP Camps, 80,000 of them children of school age receiving no education. More than 500,000 other people are living with relatives or in uncompleted buildings. “Generally talking about statistics of IDPs in Benue State is very challenging,” Emmanuel Shior, Executive Director of the State Emergency Management Agency (SEMA), told the International Centre for Investigative Reporting in April. The reason, he says, is that as the attacks continue, more people desert their villages, increasing the number of IDPs daily. 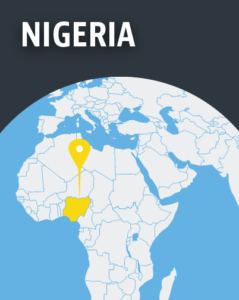 Other mainly-Christian populated states such as Taraba, Plateau, and Nasarawa, and the southern part of Kaduna state also have been affected by militant Fulani attacks. The mass burial 22 May coincided with a nationwide protest organised by Catholics. Clerics across the country urged President Muhammadu Buhari to take urgent steps to end the killing of Christians. In Kaduna, the archdiocese Vicar-General for Administration, Rev. Fr. Bulus Karis Lukas, urged the federal government to wake up to its responsibility of protecting the life of every Nigerian regardless of creed, tribe or political affiliation. “We are very saddened by the fact that our security agencies have not been able to put measures in place to bring the situation under control. Instead, the signals we are getting are that we do not have enough personnel to secure all the people of Nigeria. “In the meantime, farmers cannot go to their farms, neither are they safe in their villages. We hear reports of the killers attacking the villages and feeding the yams in the barns of the inhabitants to their cattle…. “If it was Boko Haram…it would have been sad but not as alarming as when so-called herdsmen are the ones perpetrating these crimes. “Communities are being wiped away in a manner that can only be likened to ethnic cleansing. Human life, a most sacred gift from God, has become of less value than cattle in this part of the world. This is unacceptable! “We watch helplessly as thousands of people in communities that are predominantly Christian…are being massacred, displaced from their ancestral lands and treated as second class citizens…They are victims of religious intolerance as they are denied rights to own lands to build their churches and worship their God in peace.